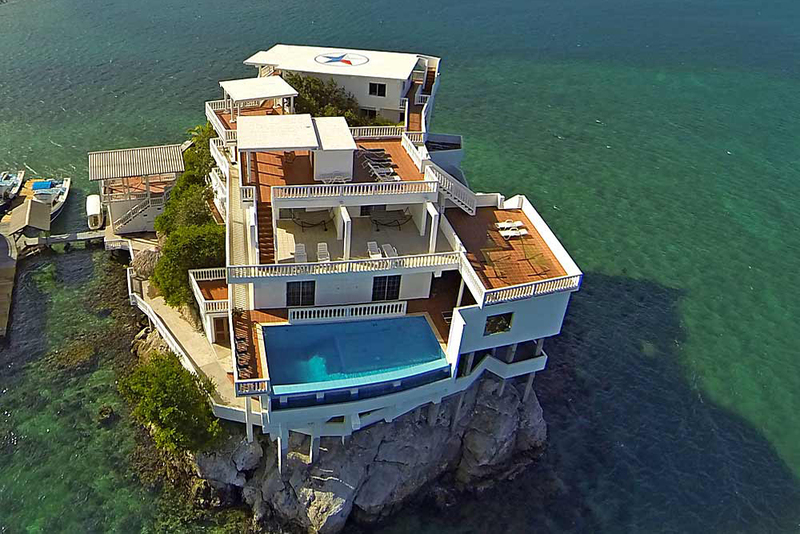 This luxury villa-hotel at Dunbar Rock (Central America, Honduras) is situated on the top of 10-meter cliff, at a distance of half a kilometer from Guanaja Island. On the three floors there are 6 bedrooms. Fresh water and electricity are available on the island due to the pipes and cables placed on the ocean floor. The villa is popular among divers. 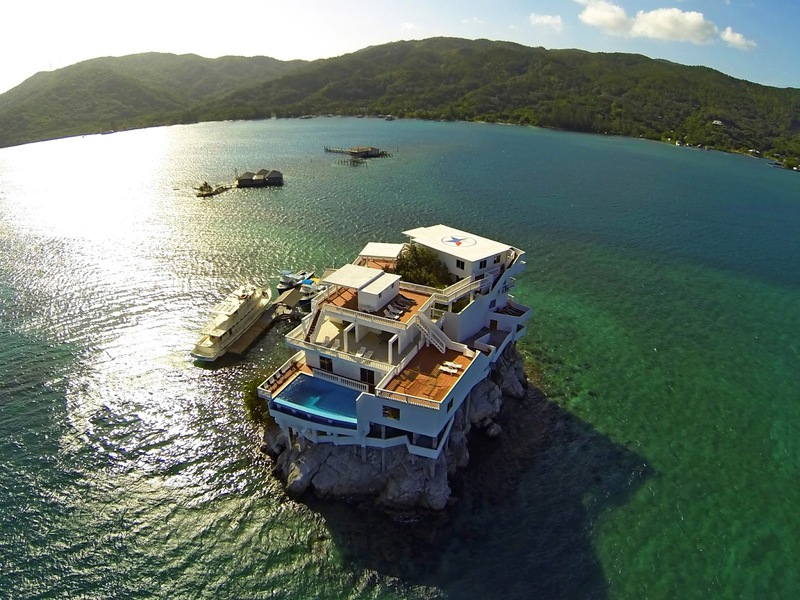 The Villa on Dunbar Rock is not just a resort – it’s a dream vacation destination. Visits to Dunbar Rock offer a unique dive vacation experience from start to finish. As you can well imagine from viewing the picture on your left, the “getting-here” is your first introduction to what sets us apart, literally and figuratively. Before you know it the Villa is in view, and thank your lucky stars you get to call this amazing place “HOME” for the next week. Once docked you can leave all your luggage behind for our delivery to your room, and focus your attention on winding your way up the stairs, or take the ramp-way around the circumference. Perched on a cay with 360° views of Sandy Bay, Guanaja and surrounding cays, this unique resort blends beauty, serenity and something unidentifiably special in a laid-back, inviting atmosphere. The 15,000 square foot property is spread across 4 floors. 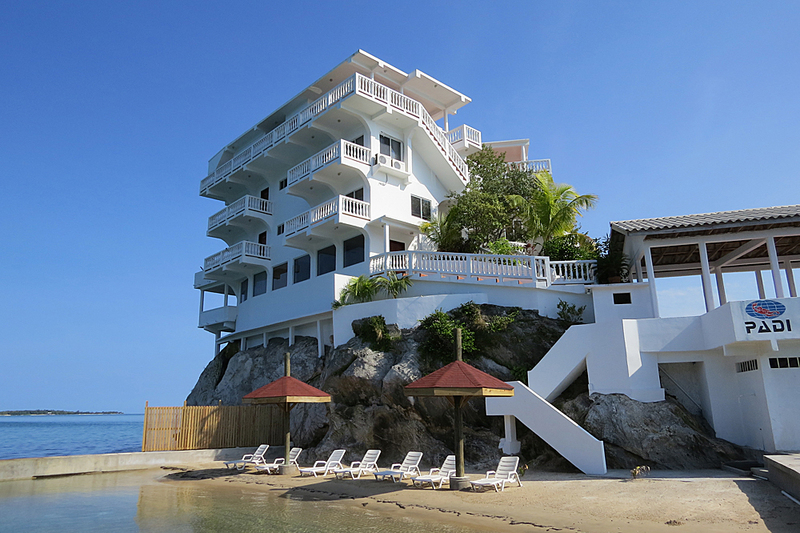 The ground level provides access to a private white sand beach for lounging, swimming and snorkeling and our PADI/SSI dive center just off the docks. A set of wide stairs leads to a roomy terrace (perhaps for our future herb garden?) then on to the 2 main levels which house our rooms and common areas. Deluxe Ocean View RoomThere are 10 rooms total at the Villa. There are 8 Ocean View rooms, 6 with two queen beds and 2 that have a king bed. There is also a Presidential Suite which includes a king bed, a separate sitting area, cable television, section with office furnishings, refrigerator, and a hot tub on the balcony. It is located on the level just below our main level. The 10th unit is the Penthouse Suite that features two queen beds, a glass enclosed living room, reception area with wet bar, refrigerator and cable television. It is (naturally!) on the top level! 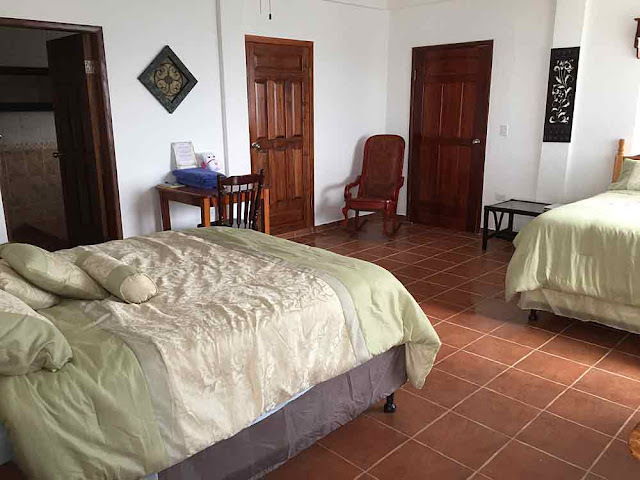 All rooms have direct ocean views, private balcony and digital safe. They are fully air-conditioned, though ceiling fans are available for those who prefer the fresh sea air. Private baths and bath amenities include shower, hair dryer, shampoo and body soap. Please bring your own travel alarm clock if needed. All linens and towels including beach towels are provided. Housekeeping services are provided daily. The electric plugs in your room are the standard US 110 V plugs. European visitors will need to bring their own adaptors. Free Wi-Fi is available in all rooms, however there are no phones. There are any number of different areas to which one can “escape” if seeking isolation or congregate if feeling social. Most of our guests tend to spend their time on the Villa’s third-level, which includes the common room with a flat screen TV/living area and inside dining room. This is also the location of the infinity pool and pool bar. Free Wi-Fi is available throughout these areas. 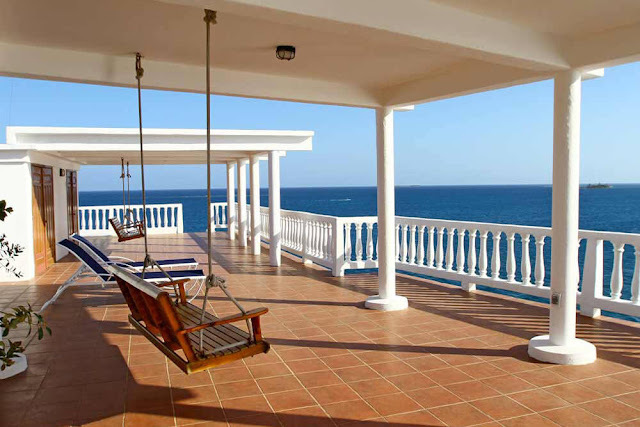 porch swings on balconiesNot to be missed is bit of relaxation time swinging in one of the porch swings, enjoying the cooling tradewinds and views offered from the fourth level of the Villa. There is also a second bar area here and table seating should you wish to take your meals “al fresco.” Four of the eight Deluxe Ocean View rooms are accessed via various stairways winding around this level. Guests who are concerned that the invigorating stair climbing won’t be quite enough to work off the homemade breakfast tortilla’s will be pleased to hear that we now have a cardio room available with a treadmill and universal gym. 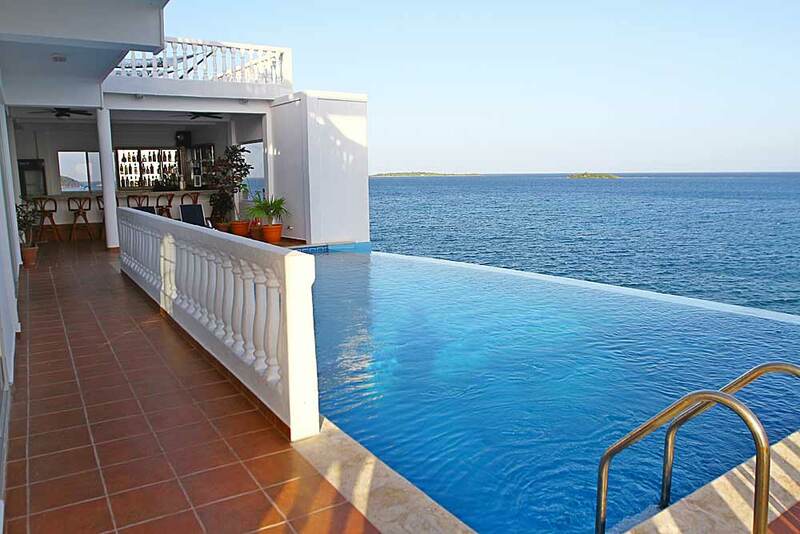 Like all rooms are the Villa, it too has a view, overlooking the pool area and southern cayes. Chef Manuel creating “Foodies” are sure to enjoy the hearty meals Chef Manuel serves up for breakfast, lunch and dinner – with a cocktail hour snack tucked in as well. There is a communal coffee urn in the dining area and we invite the first person up to plug it in if it is not already going when you arrive! Our staff will generally beat you to it as they get there early to prepare for your breakfast, which is served around 7:30. Cereal and toast are available for those who arise earlier or who just want a light breakfast. Lunch is served whenever the morning dive boats return, the late afternoon snack after the return of the afternoon boat dive, and dinner generally around 6:30 – 7:00. Provisioning in a remote location such as ours can be a bit of a challenge and therefor requires a good deal of advanced planning. We therefor query all of our guests for information on food allergies and dietary restrictions prior to their arrival. The bar is stocked with top shelf liquor and wine as well as very tasty local beer and spirits. Guests are invited to purchase a bar package which includes local liquor, local beer, juice and soda for a $150.00 per person add-on to any package or a no-alcohol add on package with just juice and soft drinks for $60.00 per person. Tax will be applied to all charges. Wine, specialty drinks, call liquors, energy drinks and bottled water are not included in either package. 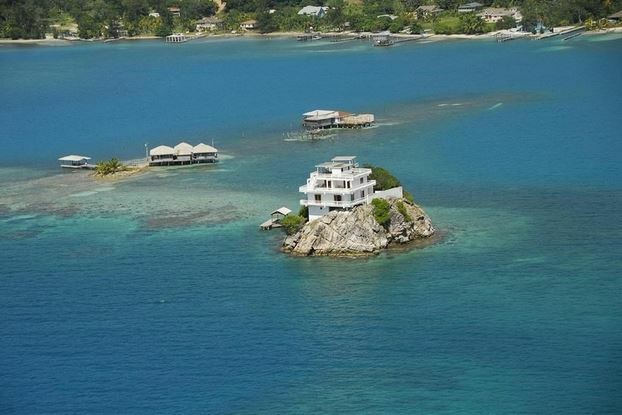 Those of you who think a vacation at the Villa means being “rock-bound” need not worry as there are always options offered to leave the cay. In addition to daily departures to go diving, our staff The Sea Angelwill be happy to give you a tour of Bonacca Town, take you on a hike to one of the waterfalls on Guanaja, or out to enjoy some good German beer at Manati Bar & Restaurant. On Friday afternoon’s all guests who wish to (which is most since we take our bartender with us!) can join us for a island tour as we cruise to Savanna Bight, stop at Graham’s place for a bit, and then head home just in time to catch the sunset.